The Portland Design Works Shiny Object offers regulated CO2 inflation in a simple and compact design. The alloy body is durable and stylish and the control knob makes inflation easy. Works with Presta and Schrader valves. 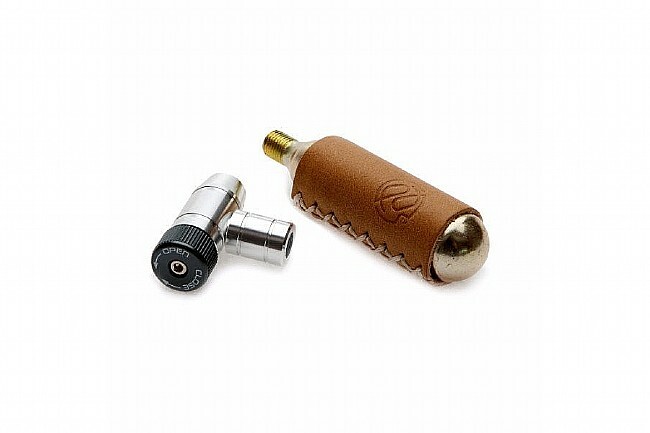 This version includes a 16g threaded cartridge and a classy leather sleeve. I've had a chance to use this several times in the past month and it works great. Easy to operate and modulate the flow of air when inflating the tire. Takes less than 30 seconds to inflate your tire once you get a new tube in place. I carry two new tubes, several glueless patches and two air cartridges in my seat pack. Love it. this product is extremly easy to use, and it is really nice to have the adjustable knob to control the flow. Love the adjustability of regulating how much air goes in the tire. The best C02 inflator I have owned. Many of the other inflators have let me down on the road, and isn't that when you really need it! The leather holder is functional and cool. The adjustment knob works really well. It allows you to control the flow. Simple and effective to use. Well constructed. I really like the compact size and the dial feature to control the flow of CO2. I usually only carry one or 2 cartridges on a ride, so blowing one on a misfire is a big problem. This is actually the second one of these I've bought. I've got one in a saddle bag on a cross bike, and now on in my road bike's bag as well.